Grade 2 winner Ms Locust Point, undefeated at Laurel Park but unraced since late June, and Grade 3 winner Late Night Pow Wow, in the midst of a six-race win streak, join multiple stakes winners Crabcakes and Shimmering Aspen in a highly competitive edition of the $100,000 Willa On the Move Stakes Saturday, Nov. 24. The seventh running of the six-furlong Willa On the Move for fillies and mares 3 and up drew a field of 11 and is joined on the nine-race program by the 46th renewal of the $75,000 Geisha for Maryland-bred/sired females 3 and older going one mile, where My Magician looks to defend her 2017 title. Jim Reichenberg, Bruno De Julio and Cash Is King’s Ms Locust Point finished fifth after pressing the pace in the seven-furlong Princess Rooney (G2) June 30 at Gulfstream Park in her most recent start. She has been working steadily at Parx for her return to Laurel, where she is four-for-four lifetime – all in stakes. The 4-year-old daughter of Grade 1 winner Dialed In won the 2016 Gin Talking to cap her juvenile season and the 2017 Willa On the Move at the end of her sophomore campaign before opening 2018 with victories in the What A Summer and Barbara Fritchie (G2). She was off the board in two subsequent graded-stakes tries including the Madison (G1) April 7, and finished third in the Skipat May 18 at legendary Pimlico Race Course. Regular rider Jorge Vargas Jr. will be aboard from Post 5 at topweight of 124 pounds. 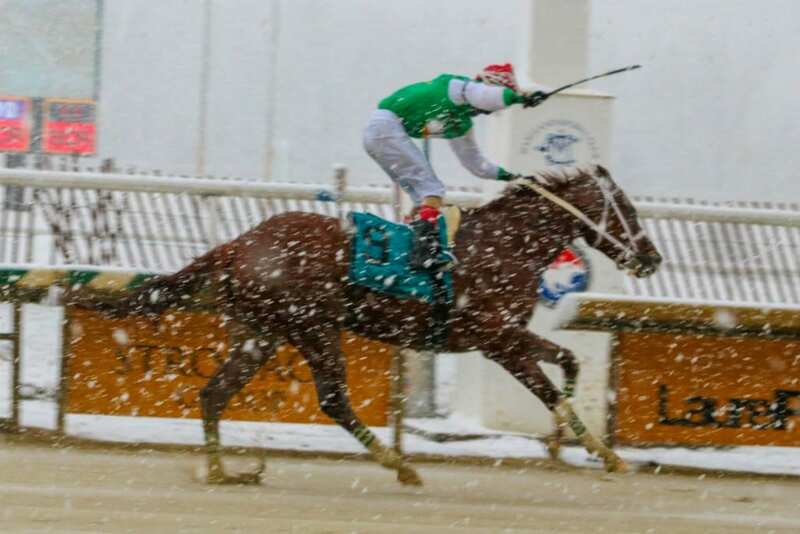 Breeze Easy’s Late Night Pow Wow is a 3-year-old West Virginia-bred filly that has won eight of her nine career starts, all coming over her home track of Charles Town. The second half of her current win streak has come in stakes topped by a neck upset of the seven-furlong Charles Town Oaks (G3) Sept. 22 at odds of 9-1. Trained by Javier Contreras, Late Night Pow Wow (8-1) will be trying six furlongs for the first time, having raced at 4 ½, 6 ½ and seven furlongs. Each of her three stakes wins has come at seventh-eighths, two against fellow state-breds. Late Night Pow Wow got familiar with Laurel’s main track with a half-mile breeze Tuesday in 47 seconds, the fastest of 10 horses. Her hometown pilot, Fredy Peltroche, is named to ride from Post 4 at 122 pounds. Morgan’s Ford Farm’s Crabcakes (7-2) will be cutting back to her favorite distance after defending her title in the seven-furlong Maryland Million Distaff Oct. 20 in her most recent effort. She has been worse than third once in 10 tries at six furlongs with six wins, and is seven-for-10 lifetime at Laurel with three seconds. All four of Crabcakes’ stakes victories have come at Laurel, winning at 2, 3 and 4 for Penn National-based trainer Bernie Houghton, nephew of late breeder Binnie Houghton of Buckingham Farm. She will carry 120 pounds including regular jockey Forest Boyce from Post 1. “She’s doing real good. She came out of that last race excellent. It’s right in Laurel and she looks pretty good in the spot. There’s some tough horses in there but I think she’ll be tough, too,” Houghton said. “I’m much more confident going six furlongs. Hillwood Stable’s Shimmering Aspen, from the barn of Laurel’s Rodney Jenkins, will be racing over her home track for the first time since finishing third behind Crabcakes in an open optional claiming allowance going six furlongs July 26, her first start in more than eight months. A two-time stakes winner at Laurel as a sophomore, the 4-year-old Malibu Moon filly has won each of her last two starts – the Timonium Distaff Aug. 25 at Timonium and the Tax Free Shopping Distaff Sept. 29 at Delaware Park. Victor Carrasco has the call from Post 9 at 122 pounds. Also entered are She’s Achance Too, a winner of four straight, all at six furlongs, for trainer Jason Egan; Discreet Deceit, in the money in 14 of 18 lifetime starts at Laurel, five of them wins; stakes winners Liz’s Cable Girl and Zipper’s Hero; multiple stakes-placed Moonlit Song; Everlasting Secret and English import Bath And Tennis, in her North American debut.